Our deepest felt sense of inter-connection transcends the limits of language. This is particularly evident when a separating wound is deep. 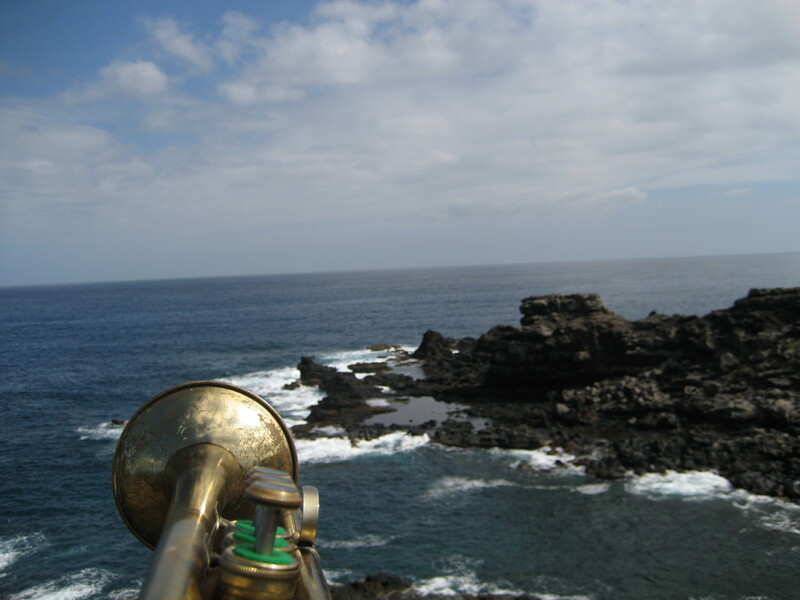 When it’s too soon for words, but time to break silence in the healing process, the healing sound of the horn can assist in bringing us back to harmony and inter-Being. All matter originates and exists only by virtue of a force which brings the particles of an atom to vibration and holds this most minute solar system of the atom together…We must assume behind this force the existence of a conscious and intelligent mind. This mind is the matrix of all matter. Horns for Healing: Horns for Healing sounded at Virginia Tech one week after a horrific shooting incident, sounded the horn at Minnesota Remembers, a memorial shortly after 9/11, sounded the horn at a ceremony after the I35W bridge collapsed, and has participated in a number of individual memorial services. On September 21, 2003, in the early evening of a Palm Springs desert, I located the back of a parking lot where I thought I would be free from disturbing anyone. After playing my trumpet for about twenty minutes I was visited by a few doves with an amazing presence. It was if they could see though me, touching the core of my soul. Within minutes more doves arrived, at least one hundred. I could hear them speaking to me. Tears came to my eyes and I could sense their pleas, the cries of desperation. I kept playing, but didn’t really put together the message they were sending. I knew something very profound had happened to me and was too afraid to mention it to my family. We retired and shortly after 3am it was like being hit over the head with a sledgehammer by those doves. I woke fully engaged in a state of awareness that was riveting and proceeded to receive one of the most direct communications of my life. The instruction was clear and concise. It was a most profound challenge to sound the horn. Conch Shells for Kids: Ancient wisdom has shown the value to increasing our ‘circle of belonging’. In an age where notions of separation, nationalism and ‘small belonging’ threaten global healing it becomes increasingly important for our youth to expand notions of ‘belonging’ to the global community. Before our violence upon one another there existed the one Golden rule to live by. Pila has referenced this as Aloha mai ke Akua ipo: “to love yourself as you love God”. Within the full understanding of this Golden Rule we come to “experience” the reality of damage done to others is truly done to ourselves. Within our acknowledgement that healing comes from “intention”, Horns for Healing will donate a conch shell to those school classrooms willing to make a sacred contract to sound the conch shell for healing at the beginning of the school day. Teachers would direct all students to send their thoughts and heart energy to a world without violence. Leaving thine outgrown shell by life’s unresting sea! • Any special occasion where the healing vibration of horn sounding facilitates alignment to our inter-Being. Check the calendar for conch shell training and performance schedule dates. Please leave your comment so we know what you think about this article. Trackback URL: Harmonic Alignment.